For years I have had a not-so-secret crush on cardamom. Although I enjoy savouring the superlative pearl sugar-topped cardamom buns served at Edinburgh’s Peter’s Yard coffee house, I usually settle for a low-effort swirl of ground cardamom in my morning porridge. It’s not only me who rates this underused (at least in the UK and US) flavouring. In countries as polar opposite as Sweden and India, cardamom is a favoured spice. For those of you who haven’t tasted or smelled cardamom it can best be described as having a distinct sweet, perfumed fragrance that once sniffed is never forgotten. If you’ve ever visited markets in southern India or the Middle East you will no doubt have seen baskets of both the black and green pods nestled among bowls of cumin seeds, turmeric root and myriad forms of ginger. Its uses are surprisingly varied: flavouring Arabic style coffee (pop a whole pod into coffee grounds before brewing), in Scandinavian breads and cakes and as a staple ingredient in traditional curries. I am so taken with this wrinkly pod that I feature it as the star of a pepper blend: 4 tbsp black peppercorns, 1 tbsp coriander seeds and the seeds from 10 green cardamom pods – and store it in a refillable pepper grinder. I have perhaps taken my cardamom obsession a bit far: for my birthday I received a bottle of Voyages d’Hermes which, when it’s been on the skin awhile, takes on cardamom and green tea notes. Delish! The Science Bit: Medicinally, practitioners of Chinese medicine prescribe cardamom for a plethora of digestive complaints, some of which are common while on chemotherapy – constipation, flatulence, gas and general stomach cramping. In Ayurvedic medicine it is seen as an important spice for balancing the three doshas (especially kapha), as well as being a warming digestive and lung stimulant. Reading in “The Cancer-Fighting Kitchen” by Rebecca Katz and Mat Edelson, I found out that Indian animal studies have demonstrated cardamom’s capacity to reduce inflammation, as well as protect against the growth of colon cancer cells. 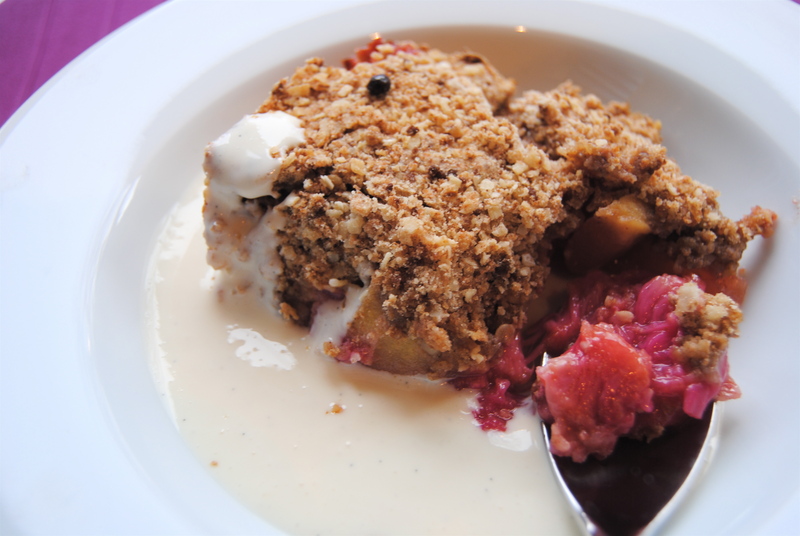 Rhubarb, oats and apples are of course no slouches when it comes to health-giving assets. 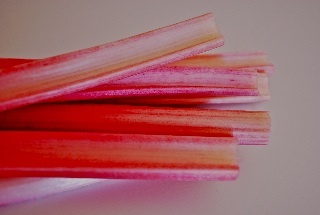 Anti-bacterial rhubarb is used in Chinese medicine for a variety of ailments, many to do with detoxification and ‘draining heat from the body’. In Western medicine it is perhaps best known for its high concentration of infection-fighting Vitamin C, for its capacity to reduce cholesterol and its action as a natural laxative. Those with gout or rheumatoid arthritis should perhaps not indulge in rhubarb as unfortunately it can aggravate these conditions. The health profile of oats is perhaps even higher as it is literally crammed with disease-checking nutrients, including avenanthramides (breaks down cholesterol and may help prevent colon cancer), blood sugar- and cholesterol-lowering beta glucan, many stress-busting B vitamins, vitamin E, iron, magnesium, selenium, zinc and filling fibre. All that and it makes a great breakfast. Apples too are very cleansing; their pectin binds with cholesterol, toxins and heavy metals, escorting them out of the body. In the lab, apples inhibit cancer cell proliferation, decrease lipid oxidation, and lower cholesterol. They also contain a variety of phytochemicals, including quercetin, catechin, phloridzin and chlorogenic acid, all of which are strong antioxidants. Studies have shown that apples protect and optimise lung function. While storage doesn’t affect their anti-oxidant capacity it is thought that heat may diminish it. As apples are so commonly eaten they are potentially very beneficial to us. To find out more, click here. 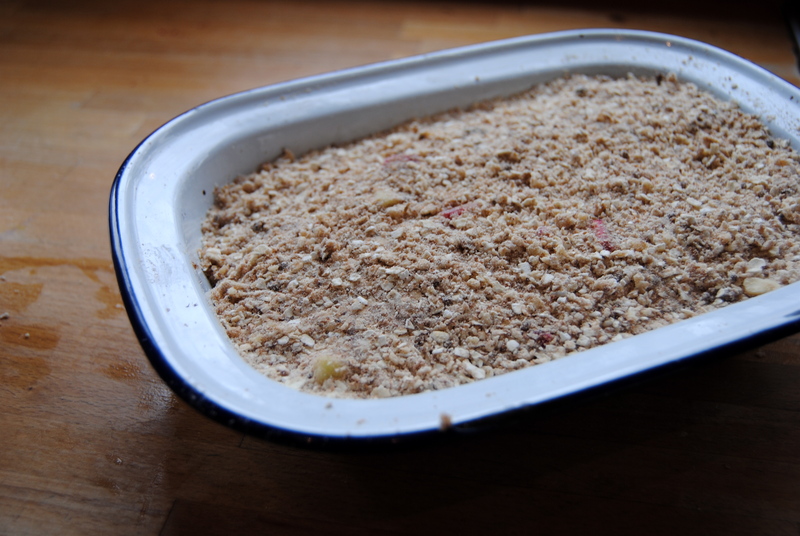 So, although this crumble is hopefully scrummy, eat raw apples to get the most from them. That said, all-important fibre remains helpfully intact. Enough science, let’s get on with the (healthy) stodge! We are smack in the middle of forced rhubarb season just now so I’ve been transforming the pink leggy beauties into crumble, chutney and jam. The crumble disappears in a trice but chutney and jam can of course be enjoyed for months to come. I’ll give an easy rhubarb and date chutney recipe later. What To Do: Preheat the oven to 180C/350F. In the large bowl toss together the fruit, sugar or agave nectar and half of the cardamom. Pour the fruit into the baking dish and set aside. Next, start the crumble topping by putting the butter, flour, all but 2 tbsp oats, sugar, cinnamon and remaining cardamom in the food processor; pulse until you get what looks like coarse breadcrumbs. Add in the nuts and pulse until you get a mixture of chunky and fine bits of nut. Add the remaining oats and pulse twice for two seconds to just mix in the oats. 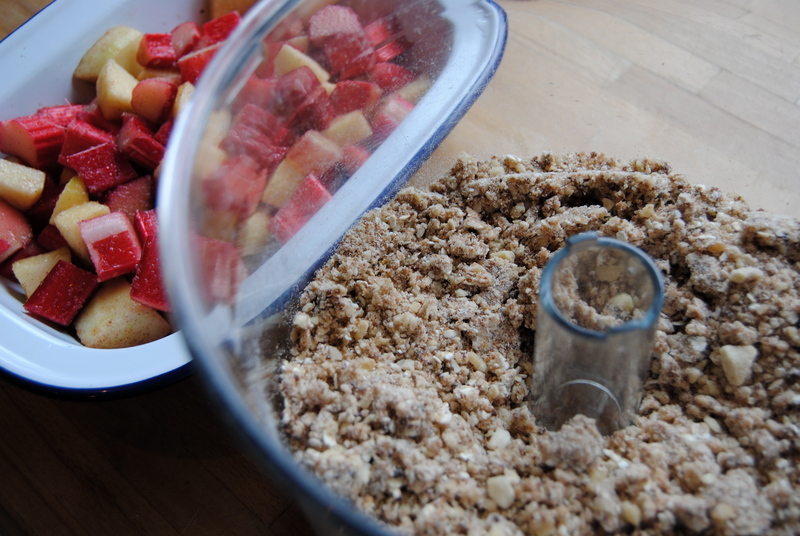 Evenly sprinkle the crumble mixture over the fruit and press firmly down. You may be tempted to leave it all bumpy and rustic but it’s crisper if you take a firm hand to the crumble. Some of the nuts will stick up a bit anyway. 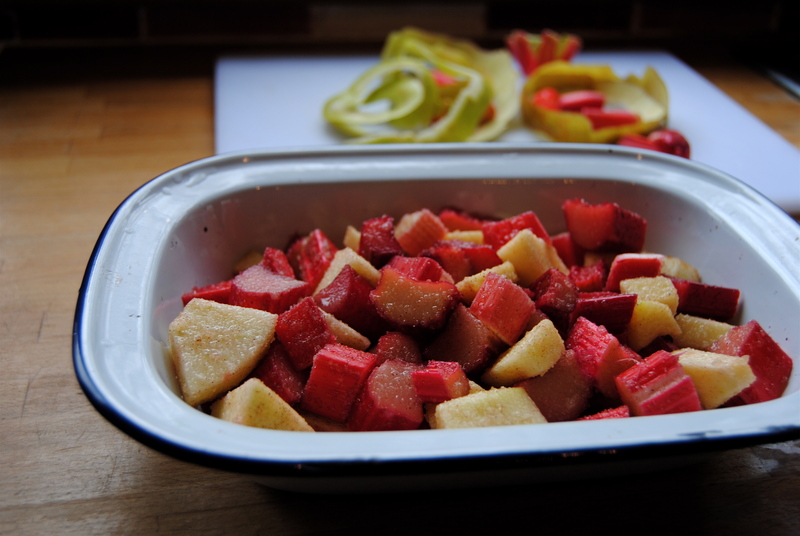 Put the dish in the hot oven for about 40 minutes, or until the sticky pink rhubarb bubbles out from the sides. Leave it to cool for 15 minutes or so before serving up with vanilla-flecked custard or ice cream. 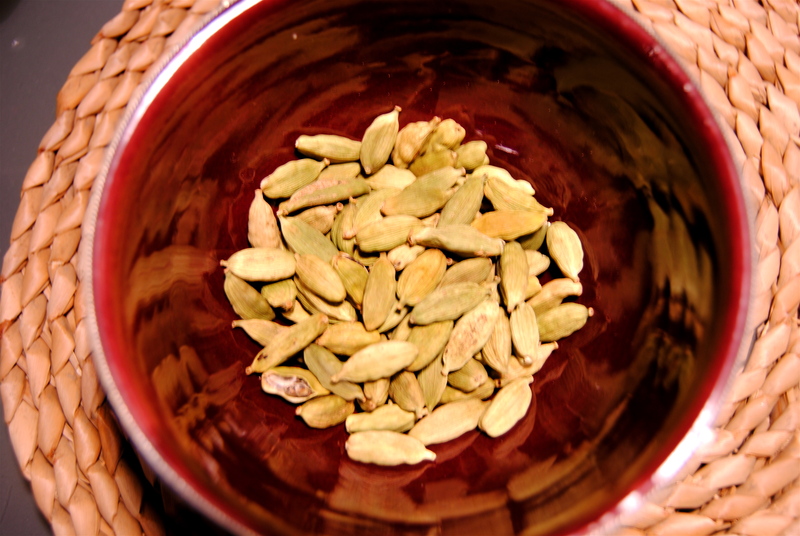 * Cardamom powder: Ground cardamom is quite expensive and hard to find in the UK. Make your own powder by purchasing a bottle or bag of green cardamom pods from your supermarket or specialty shop (those stocking Indian and Pakistani goods will be cheapest). Crack open the tough shells in a pestle and mortar or the end of a rolling pin, pick out the fragrant slightly sticky seeds and bash them fiercely in a pestle and mortar or in a clean coffee grinder. Use whole pods in Indian cooking (including spiced rice), removing them before serving. Gluten-free note: You can easily make this gluten-free by either using gluten-free flour and gluten-free oats, or using barley flakes and blitzing to make flour and keeping the rest whole. 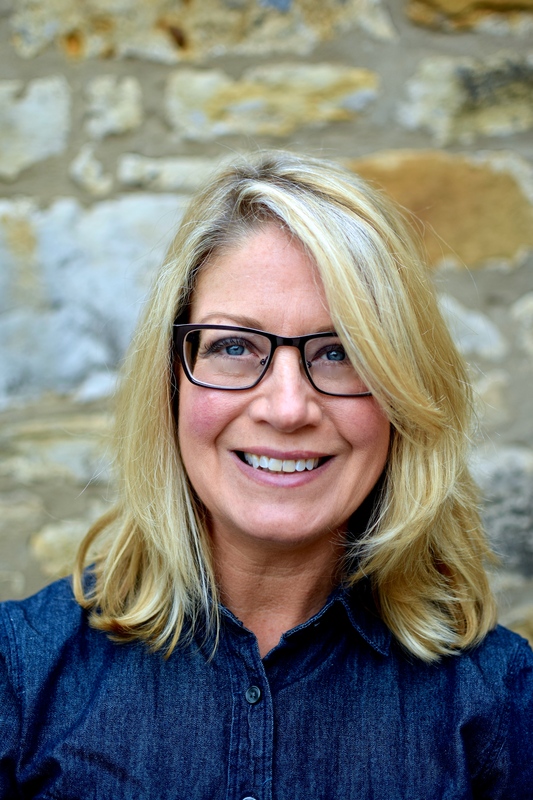 My friend Niki at unifiedspace is a fantastic amateur photographer and this is her photograph. Thanks Niki.